Jammu and Kashmir (J&K) witnessed the worst flood 2nd September 2014 onwards during the last stage of Indian monsoon. This triggered flooding and landslides in the region. On the 5th of September the Jhelum River was reported to be flowing over the danger mark. About 2600 villages were reported to be affected in the entire state out of which 390 village in Kashmir valley were completely submerged. Over 12.5 lac families were directly and indirectly affected by the floods. Loss of property was estimated to be around a crore. As per the assessment and observation of AMAN’s field team during the course of immediate flood relief intervention activity, thousands of families lost their residential houses in the flood particularly in the districts of Pulwama, Anantnag, Srinagar and Bandipora. While most of the humanitarian agencies/organizations focused on south Kashmir and Srinagar for relief and rehabilitation initiatives the villages across Bandipora district located in northern region of Kashmir valley remained unattended. 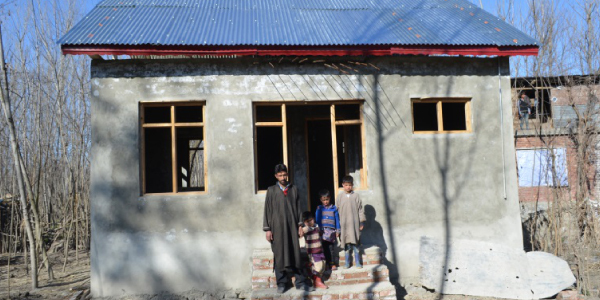 AMAN by the generous support from ‘Habitat for Humanity’ aided the construction of ‘pucca house’ for the flood affected families in the villages of Bandipora district. The beneficiaries were the families who faced a massive loss of property including their houses and survived in make shift tents before the support arrived. In total, twenty two houses were constructed under this support program over a period of nine month.